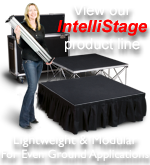 Our Intellistage equipment and wheelchair ramps work with Staging 101 Stage platforms and allow equipment and people easy access to the stage. 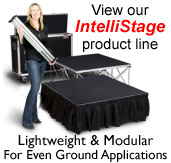 Easy assembly, compact storage and lightweight, but solid construction are what set Intellistage ramps apart. Ramps consist of metal frames and adjustable legs. Standard Intellistage platforms (carpet finish, or Tuffcoat finish) are then installed into the metal frames to create the ramp. 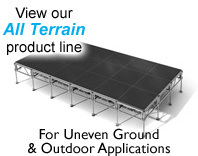 Intellistage ramps offer maximum installation flexibility. Ramps can be attached to Intellistage stages straight on, on the side with a landing and in switchback or 90 degree angle configurations for optimal usage of available installation space. Their modular design is also a plus, allowing for easy upgrades when stage heights change. All wheel chair ramps come standard with guard rails and guard rail options are available for equipment ramps. Transportation/storage systems are also available. Equipment ramps are perfect for rolling equipment on and off stage. Equipment ramps are steeper than wheelchair ramps. Equipment ramps can be configured as either Straight, Straight with Landing, Switch Back or 90 Degree Turn. Guard rails are also available. Wheelchair ramps have a 1:12 slope ratio to make it easier for wheelchair users to access the stage. Wheelchair ramps come standard with guard rails. Wheelchair ramps can be configured as either Straight, Straight with Landing, Switch Back or 90 Degree Turn.